Balloon Bash is another new stamp set from the Occasions catalog. The new Occasions catalog and Sale-A-Bration promotion starts January 6th! For every $50 you spend, you can pick one FREE Sale-A-Bration item. This is Day 2 out of 5 for our mini blog hop with my friend from the Netherlands, Christa Halsbema. 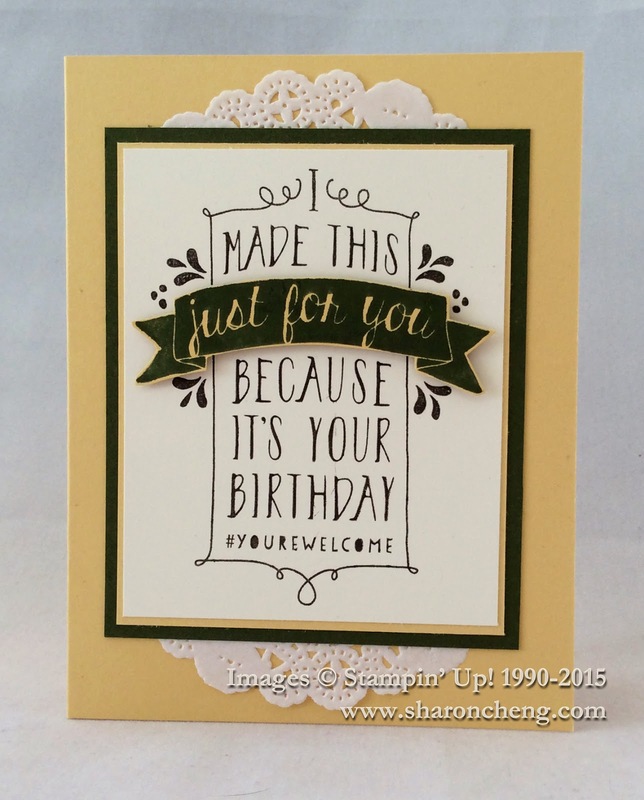 Christa and I are celebrating with 5 days of new projects featuring stamp sets and other products from the Occasions and Sale-A-Bration catalogs. Check out both of our blogs every day this week for fresh ideas. You'll love her cards using the Balloon Bash stamp set. Christa's blog is Dusk till Dawn. Be sure to use Google translate to see her posts in English. I made this card for a recent Stampin' Up! demonstrator swap. The colors are So Saffron, Mossy Meadow and Very Vanilla. I first stamped the sentiment in Early Espresso. Then I stamped it again with Mossy Meadow and cut out the banner. The Just for You banner is attached with Stampin' Dimensionals. I have two In-A-Minute tutorials that show some of the tips and techniques that I used while making this card. Balloon Bash is a photopolymer stamp set. Here is an alternate way to store your photopolymer stamp sets in their stamp case. This IAM tutorial shows you how to fussy cut images like the Just for You banner. Visit my online store to get what you want for your next project. Remember that when you purchase $25 or more in product, you are eligible for my Rewards Program. Spend $50 and choose one FREE Sale-A-Bration item! Nice card! Together with Christa you give a lot of ideas how to use this stampset. Oh,I like this. Very elegant look.